The Catskill Mountainkeeper, a tax-exempt charity under Federal and New York State law, is engaging in blatant lobbying although it says it does almost none. 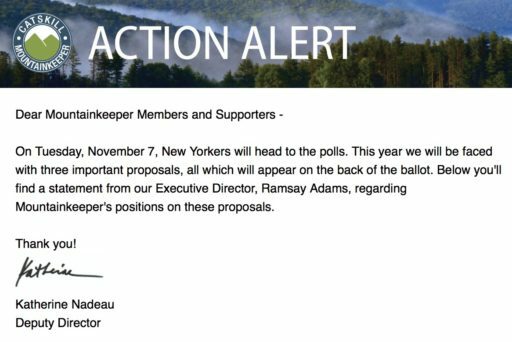 One of our readers forwarded me a Catskill Mountainkeeper emailer this morning and made a very good point; “I think they should lose tax exempt status if they are telling or advising their members how to vote. This is what I am cautioned about at church.” He’s correct, of course. He was referring to the fact the emailer, written by Katherine Nadeau, wife of Politico reporter Jimmy Vielkind, specifically urged Catskill Mountainkeeper members how to vote on two ballot proposals. Yet, the Catskill Mountainkeeper, a part of the NRDC gang, told the IRS it only spends $225 per year on grass-roots lobbying which is, of course, exactly what the emailer is. Catskill Mountainkeeper works tirelessly to protect the Catskill Park and region. We oppose a constitutional convention as laid out in ballot Proposal 1; the Catskill Mountains and New York City’s drinking water need every protection we can afford them. A constitutional convention could turn back the clock on the defenses we’ve fought hard to implement, and in doing so put our very health at risk. Additionally, we wholeheartedly support creating a small land bank for Catskill and Adirondack communities as laid out in Ballot Proposal 3. The land bank will allow our communities to make needed health and safety improvements, including fixing unsafe roads, improving drinking water quality, and creating bike paths. New Yorkers will have to flip the ballot to see the proposals, and we hope that they will—there is so much on the line. It shows a measly $225 spent on grass-roots lobbying for 2015, none in 2013 and 2014 and only $1,262 in 2012, an average of $372 per year for an organization that exists primarily for political purposes. It’s not just a joke but a corrupt use of the tax-exemption system that’s intended to support legitimate charities. Nothing about this is surprising, sadly, as both fractivist groups and their elitist foundation sponsors have been abusing the system for decades. But, when will legislators step up to do something about it? When will industry groups and others start challenging this abuse? It’s also worth noting Katherine Nadeau previously worked with Environmental Advocates of New York and the New York Public Interest Research Group (NYPIRG), both of which are integral parts of the Rockefeller network of special interests opposed to fracking that would upset their plans to make a wilderness of Upstate New York so it can be their private playground. On the other hand, her husband, Jimmy Vielkind, has shown some healthy skepticism of Governor Corruptocrat of late. Too bad he doesn’t apply that skepticism to the NRDC gang that employs his wife and their web of connections.